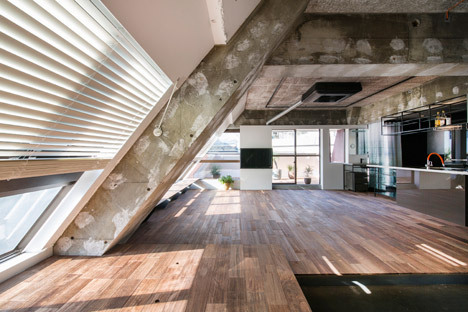 Japanese office G Studio added swathes of white paint to the walls of this loft apartment in Tokyo, making it look like the space is unfinished (+ slideshow). G studio worked with architects Teruya Kido and Suma-Saga-Fudosan on the project. 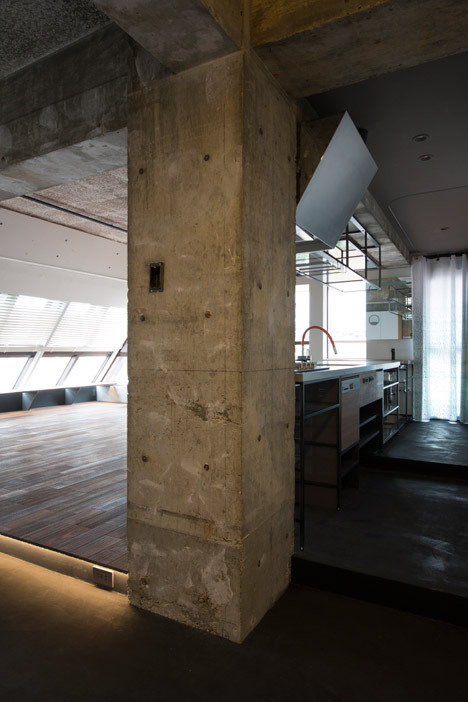 Named Tokyo Loft, the apartment occupies one of the uppermost floors of a 1980s housing block and was designed specifically to be used as short-term accommodation for tourists. 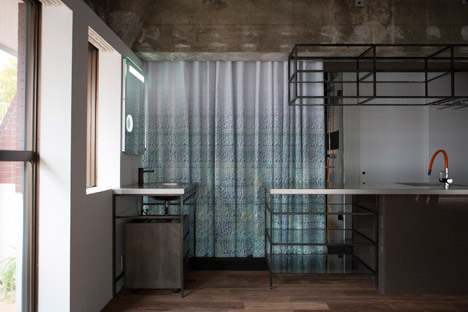 Rather than offering a polished hotel-like interior, G Studio chose to deliberately create a space that combines home comforts with raw industrial finishes – in order to "achieve harmony" between the two aesthetics. 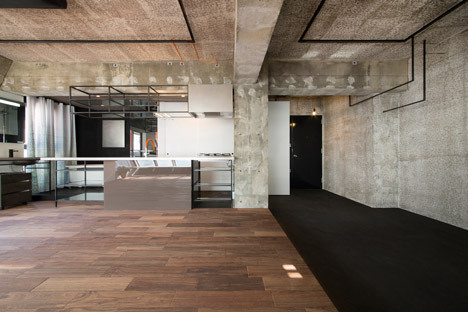 "Since this apartment is to be used for accommodation purposes, we took the unique character of the apartment and added a hotel-like atmosphere," said designer Ryohei Tanaka. 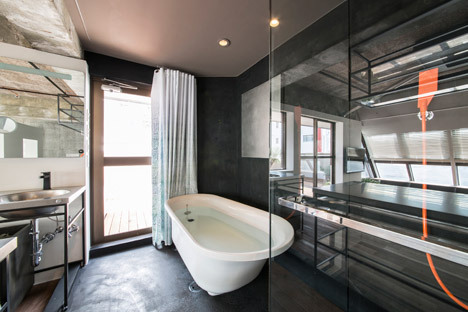 The raw concrete walls and ceilings were updated using a painting technique intended to create the effect of Japanese Washi paper. It involved spray painting A4 sized sheets of resin against the surfaces, then removing them to reveal a spiral-like texture. "This mixes the old wall with the new wall," the designer told Dezeen. "Just renewal is boring. Something old is not just old, and it is better than just new." 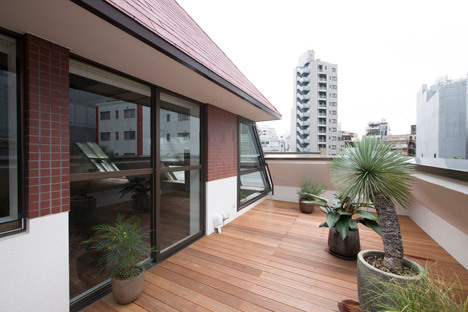 The space is organised around a large living space that opens out to a balcony terrace. A bedroom, bathroom and kitchen are arranged around the outside, along with an entrance area. 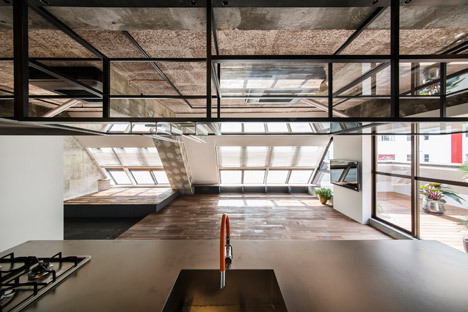 On one side of the apartment, a row of skylights were built into the sloping ceiling to offer views of the city. This allows plenty of natural light into the open-plan living space, which features a metal kitchen unit along one edge. 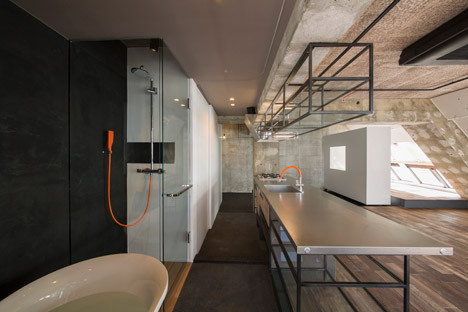 Wooden floorboards are used throughout the apartment, with bright orange electrical wires and plumbing features left exposed to enhance the industrial look. To make the space more welcoming to guests, typical hotel features including a freestanding bathtub and a bar area were also added. Tanaka believes this style of accommodation allows tourists to be "exposed to the real culture" of Tokyo. "Due to websites like Airbnb, there has been an increase in popularity with these types of short-term apartment rentals," the designer added. "These are customers who are dissatisfied with traditional hotels and would like the comfort of a home while travelling." The project is expected to become a template for rejuvenating the city's disused "pencil buildings" – which were built during Japan's economic growth in the 1980s and earned their nickname because they sit on plots of land disproportionate to their height. 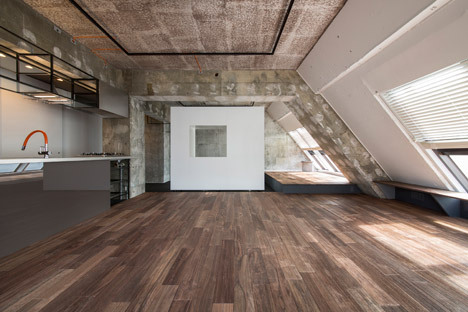 "Plans are in place to increase these types of apartments in Tokyo with this apartment being the first test model for future projects," added the designer.